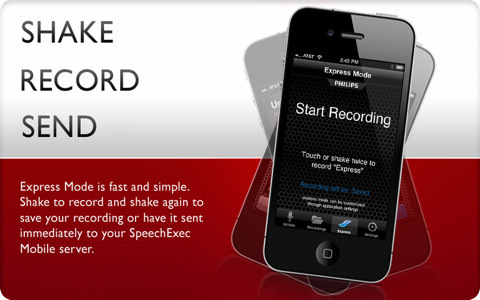 Philips Dictation Recorder for iPhone capture your thoughts on the move. SpeechExec for iPhone Enterprise presents a new dimension to wireless working. Recording, editing and sending dictation files from your iPhone offers mobile flexibility and reduces document turnaround time. SpeechExec is the perfect companion for your iPhone, delivering everything you need for secure, wireless dictation workflow.